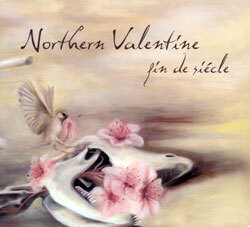 Northern Valentine is a Philadelphia based ambient/drone collective anchored by husband & wife, Robert & Amy Brown, Jeffrey Bumiller & Matthew Primak, here in an album collecting their beautiful sonic creations. "Since 1998 Northern Valentine has been perfecting their version of drone music - based on improvisation & the emotions of the performers reacting to their physical environment & to each other at that moment, feeding off of & amplifying each other's energies. Here they collect more of the unique drones that have made them a staple of the genre. Northern Valentine is a Philadelphia based ambient/drone collective anchored by husband & wife, Robert & Amy Brown, Jeffrey Bumiller & Matthew Primak. Coaxing sounds from electric & acoustic sources, they weave meditative drones & soundscapes with "barely there" post-rock instrumentation to create a tapestry that Phil McMullen (Terrascope Online) refers to as "minimalist ambiance at its best. Heartfelt, soulful & affecting, like gazing into a scrapbook of memories". The music they create is largely improvisational & is often performed along with films or visuals that the collective has created. Writing about their 2008 Silber Records debut, The Distance Brings Us Closer, Jeff Penczak (Foxy Digitalis) stated..."Northern Valentine's music delivers a sense of floating in space or a communion with nature where the listener is enveloped in clouds of billowing sonics. The listener's imagination can run wild creating images to accompany this ambient soundtrack...In sum, an awesomely hypnotic listening experience." They have drawn comparisons to a wide range of artists; from Labradford, Windy & Carl, Flying Saucer Attack, Fennesz & Eluvium, to Mogwai & Godspeed You! Black Emperor. They have been performing live since 2006, having toured periodically throughout the Eastern/Southern US, as well as in Iceland in 2008.